Real Madrid v Liverpool: Could James Milner be key to Champions League final? Is Milner the unlikely key man in Kiev? 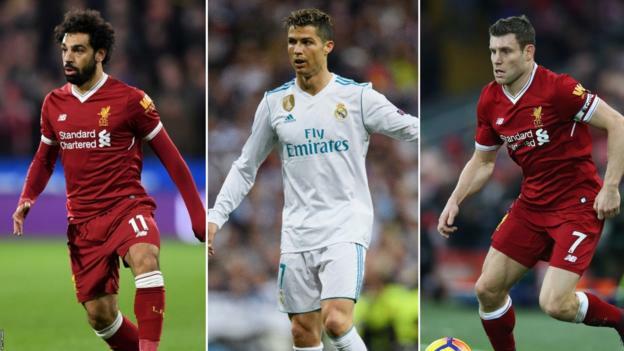 With 91 goals between them in all competitions this season, it is hardly surprising the Champions League final has been billed as a battle between Real Madrid's Cristiano Ronaldo and Liverpool's Mohamed Salah.Both are sure to be in the running for the Ballon d'Or at the end of 2018, but it is a man who is unlikely to receive any individual accolades who could hold the key to success in Kiev.James Milner made headlines in the semi-final against Roma when he took his tally of assists in this season's competition to eight, equalling the tournament record set by Neymar in 2016-17.
bbc.comThat total is three more than Real Madrid's entire midfield of Luka Modric, Toni Kroos, Isco, Marco Asensio and Casemiro have managed between them.Milner's increased productivity in the final third has been the most notable aspect of his Champions League displays - he has gone from an assist every 588 minutes in the Premier League to one every 99 minutes in Europe. But there has been more to his superb European form than just creating goals. The former England midfielder, already a strong performer domestically, has raised his game in the Champions League in almost every statistical category. Who is more vulnerable at the back - Real or Reds? The most attack-minded Champions League final yet? Has a major final ever promised so much in an attacking sense?For years fans have marvelled at the BBC - Gareth Bale, Karim Benzema and Cristiano Ronaldo - all of whom could play on Saturday. But, despite being one of the great forward lines of the Champions League era, they will not even be the most prolific front three on display in Kiev.Sadio Mane's strike in the semi-final second leg in Rome made the Senegal forward, Salah and Roberto Firmino the trio to score the most goals in a single Champions League season, surpassing a record set by their Real counterparts four years ago. Despite his success in the Champions League, Real finished third in La Liga, 17 points behind champions BarcelonaIn January Zinedine Zidane's future was the subject of much discussion, with the Frenchman himself describing the state of affairs at the Bernabeu as a "fiasco" following a shock home Copa del Rey defeat by Leganes.That, coupled with the fact Real were 19 points adrift of leaders and eventual champions Barcelona, led Zidane to say it was "clear" his future at the club depended on their progress in the Champions League.And, as has become the norm for Zidane's Real, it is that competition in which they have dominated, in results if not always in performances.The 1998 World Cup winner has led Real to the Champions League final in all of his three seasons in charge and is one game away from becoming the first manager in history to win Europe's premier club competition in three consecutive campaigns.Were he to lift the trophy in Kiev, he would become only the third coach - after Bob Paisley (Liverpool) and Carlo Ancelotti (Real and twice with AC Milan) - to be a three-time European champion. That knack for winning major finals is something his counterpart Jurgen Klopp has yet to master. The Liverpool boss has lost five of the six major finals he has been involved in, including his two previous European finals.The first came with Borussia Dortmund, when they lost the 2013 Champions League final to Bayern Munich at Wembley, while the second came when Liverpool were beaten by Sevilla in the 2016 Europa League final.Were Liverpool to lose, Klopp would become the fourth manager - after Max Allegri (2015 and 2017), Diego Simeone (2014 and 2016) and Hector Cuper (2000 and 2001) - to experience defeat in two Champions League finals.His team, though, have no such negative experiences. Not one player to have played for Liverpool this season has appeared in a Champions League final, a stark contrast to Real's squad, eight of whom are in line to win the trophy for a fourth time.